Few climates anywhere in the world can match the year-round pleasant nature of Swain County’s climate. The lack of seasonal extremes allows for frequent outdoor activities and comfortable living throughout the year. Among the most valued aspects of Swain County’s climate are the cool summer nights which have lured visitors to the area for generations. 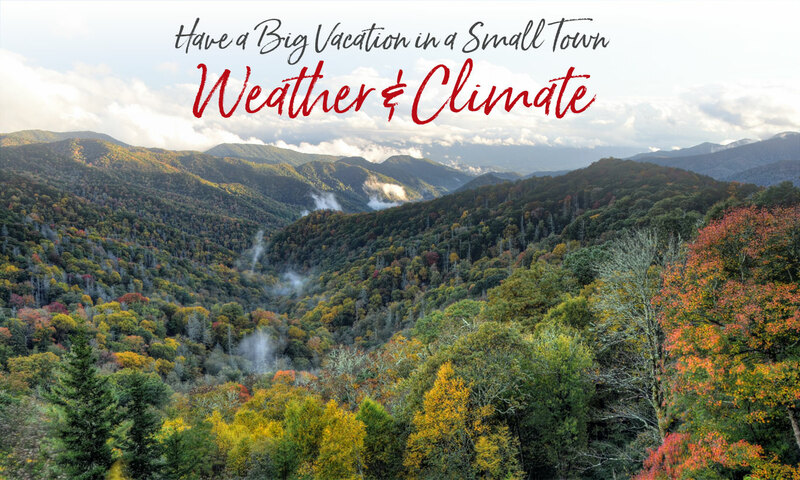 In the Bryson City area, July temperatures reflect an average daily high of 84 degrees and an average low of 62.4 degrees. Winter temperatures, while cool, are not uncomfortable. The average daily high in January is 47.5 degrees, while the average low is 26 degrees. You can be notified of the status of the Park’s four most popular roads — Newfound Gap (U.S. 441), Little River Road, Laurel Creek Road, and Cades Cove Loop Road — by opting to get text messages to your cell phone. Simply text: ‘follow smokiesroadsnps‘ to 40404. To stop receiving the text message alerts, text ‘stop smokiesroadsnps‘ to the same number. Standard text rates will apply. You can get that same information via the Internet by going to twitter.com/smokiesroadsnps to read recent road notification postings. This is a Twitter website maintained by the Park, but anybody can access it at any time without having to establish a Twitter account. Have a Twitter account? Go to the site listed above and click the “follow” button to see the updates on your own account page and receive the notifications in the manner you specify.